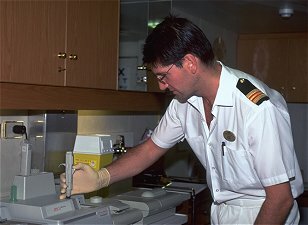 Register for Cruise Ship Doctor Jobs Now! Board certification or equivalent in Emergency Medicine, Family Practice or Internal Medicine. Current certification as an ACLS Provider (Advanced Cardiac Life Support) or its equivalent, unless Board Certified in Emergency Medicine. ATLS (Trauma) Certificate and PALS (Paediatric) Certificate helpful, but not mandatory. Some experience or a willingness to learn simple laboratory and x-ray procedures. Current license, extensive experience with cardiac and primary care, trauma, internal, and emergency medicine. Excellent command of the English language required (both spoken and written). $7,500 - 11,000 U.S. per month, depending on the cruise line and accumulated experience with the company. Possibilities for promotion to Senior Doctor position. The doctor/ physician reports to the ship's chief doctor and supervises the ship's lead nurse, nurse practitioners and registered nurses. The physician is responsible for the basic and emergency medical treatment of the crew members and in some cases of the passengers (when required). He/ she deals with wide range of medical conditions - evaluation and treatment of medical, surgical, gynaecological and paediatric problems; suturing of wounds; incision and drainage of abscesses; evaluation of ophthalmologic emergencies; reduction of simple dislocations, splinting and immobilization procedures; Advanced Cardiac Life Support procedures and treatments (ACLS) including emergency airway management; administration of thrombolytic agents.